Rose started 2018 ranked sixth in the world after his remarkable finish to 2017, winning the WGC-HSBC Champions and the following week's Turkish Airlines Open before adding more silverware in Indonesia. After a steady tie for 22nd in Abu Dhabi, Rose returned to the PGA Tour and was three shots off the lead heading into the final round of the Farmers Insurance Open, only to close with a disappointing 74 as Jason Day pipped Alex Noren and Ryan Palmer in a play-off for the title. Rose then decided to recharge his batteries with a four-week break in February before returning to action at the beginning of March in the WGC-Mexico Championship, where he atoned for a rusty first three days with a final-round 67 which lifted him to fifth in the world rankings. The following week's Valspar Championship saw Rose back in contention again as a five-under 66 in the third round took him within one shot of the lead and alongside Tiger Woods, although he again faded out of the running with a Sunday 73 as fellow Englishman Paul Casey claimed his first PGA Tour win for nine years, holding off Woods by a shot. A busy spell for Rose continued with the Arnold Palmer Invitational and there was another top-10 finish at Bay Hill as he took third spot behind a rampant Rory McIlroy, and Rose then decided to skip the WGC-Dell Technologies Match Play as he stayed focused on the Masters. Rose failed to make the top 50 in Houston and watched intently as his close friend Ian Poulter snatched victory and the final available spot in the field at Augusta National, where Rose had lost a dramatic play-off against Sergio Garcia 12 months previously. Rounds of 72 and 70 left Rose seven behind the halfway leader and eventual champion Patrick Reed and, although his weekend scores of 71 and 69 were also respectable enough, he was unable to mount a late charge and ended up in a tie for 12th place on six under, nine behind Reed. Rose was not back in action until The Players Championship and a final-day 66 at TPC Sawgrass earned him a respectable tie for 23rd, albeit nine shots behind runaway champion Webb Simpson, but the Englishman's decision to play in Forth Worth instead of the BMW PGA Championship reaped handsome rewards at the end of May. Rounds of 66 and 64 earned him a one-shot lead at the halfway stage at Colonial and he extended his advantage to four with a four-under 66 in the third round. Rose then closed with another 64 to finish on 20 under and prevail by three shots from Brooks Koepka for his ninth PGA Tour title - a performance which hoisted him to third in the world. Rose missed out on the win he needed at The Memorial to become world No 1, although he was not far off as he finished three off the lead at Muirfield Village, and he carried his good form to Shinnecock Hills as he chased his second US Open title. After starting 71-70, a two-over 73 on a controversial Saturday proved good enough to put him just one behind Dustin Johnson and his compatriots Brooks Koepka, Tony Finau and Daniel Berger. But a double-bogey at the fourth was costly for Rose on the final day and another 73 left him in a tie for 10th as Tommy Fleetwood's stunning 63 was not enough to deny Koepka back-to-back titles. Rose then headed back to the UK and earned another top-10 finish with four sub-70 rounds at the Aberdeen Standard Investments Scottish Open, and he was highly fancied heading into The 147th Open at Carnoustie only to find himself battling hard to make the halfway cut. But he extended his tournament by holing a brilliant 12-foot putt for birdie on the 18th green which got him into the weekend with nothing to spare, and Rose suddenly found himself in contention for the Claret Jug after a superb 64 on Saturday, although a closing 69 - capped by his fourth birdie of the week at 18 - was two shots too many. Now ranked second in the world after a prosperous fortnight in Scotland, Rose dropped two places following the PGA Championship at Bellerive as he finished nine shots adrift of an inspired Koepka, and he then missed his first cut of the year at the Northern Trust - the first of the four FedExCup Play-Off events. Rose responded with a strong performance at the Dell Technologies Championship in Boston, where he finished runner-up to Bryson DeChambeau, and he was firmly in the mix again in Philadelphia as a third-round 64 hauled him into a one-shot lead at the rain-hit BMW Championship. A Monday finish was required due to the adverse weather, and Rose went into a play-off against Keegan Bradley safe in the knowledge that he had done enough to be crowned world No 1 for the first time in his 20-year professional career, although he left Aronimink with mixed emotions after missing a six-foot putt to gift Bradley victory at the first extra hole. Rose's stay at the top lasted only one week as Johnson returned to the summit after the Tour Championship, but he had the lucrative consolation of landing a $10m bonus as FedExCup champion with his fourth-placed finish as Tiger Woods returned to the winners' circle amid astonishing scenes in Atlanta. That brought the curtain down on the PGA Tour season with Rose flying to France on a high to join his Ryder Cup team-mates at Le Golf National, and he was celebrating again when Europe romped to a resounding seven-point win with Rose contributing two points - both with Henrik Stenson - from his four matches at Le Golf National. 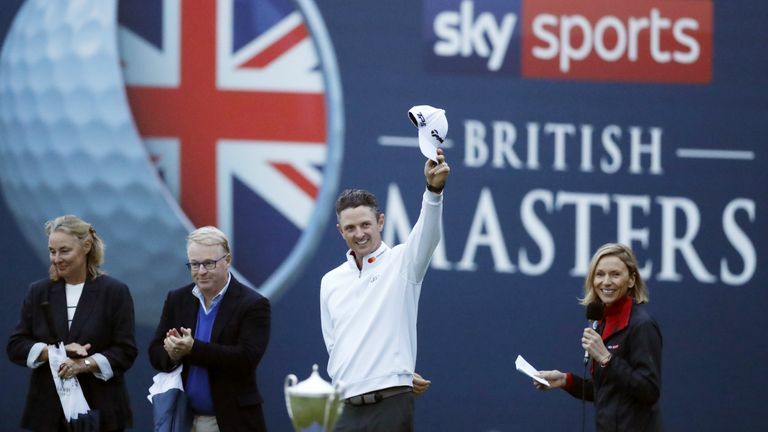 Rose's next task was to be the host of the Sky Sports British Masters at Walton Heath and he went into the tournament recovering from a stomach bug, but he did well to finish in eighth place before handing over the trophy to Eddie Pepperell. Justin Rose reflects on his week and getting the opportunity to host the Sky Sports British Masters. He was back to full fitness in Shanghai a fortnight later and mounted a strong defence of his WGC title, claiming third place behind Xander Schauffele, and Rose headed back to Turkey bidding to successfully defend a title for the first time in his career and leap back above Koepka to world No 1. And he achieved both when he held his nerve to edge out Haotong Li at the first extra hole, but his second tenure at the top of the world rankings was again just a single week as Koepka returned to the summit, only for Rose to reclaim the place without hitting a shot the following week. The complexities of the world rankings saw Koepka return to world No 1 a week later, and Rose looked likely to replace him at the Hero World Challenge until Tony Finau holed a significant birdie putt on the final hole which relegated Rose into a share of third place in the Bahamas.